Africa needs at least another 300,000 kms of metro and interurban fibre to extend 4G coverage and be ready for 5G, according to “The Future of African Fibre Networks”, a new report by Xalam Analytics. Sub-Saharan African (SSA) countries have deployed around 260,000 kilometers in new terrestrial fibre links since 2010. Today, Africa has close to 600,000 kilometers of fibre. At least another 300,000 kms are needed to meet top line national plan targets and moderately densify major African metros. 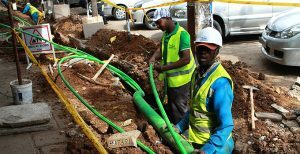 The nature of the African terrestrial fibre market is evolving, moving from a phase of terrestrial fibre scarcity, with its focus on mobile operator self-provisioning, to an era of more open, more competitive fibre markets where independent fibre companies proliferate. Today, private, wholesale-focused fibrecos account for 50% of all wholesale providers (up from ~30% in 2010), a rise that has fundamentally altered the nature of the African terrestrial fibre market. African governments have committed around $1.7bn to building fibre transmission networks since 2010. Governments now control around 30% of all installed fibre in Sub-Saharan Africa (excluding South Africa). In many markets, the government is the largest holder of terrestrial fibre capacity, a trend that carries significant implications as Africa gets deeper into the 4G and 5G era. As more countries deploy backbones, the fibre bottleneck is resolutely shifting towards metro networks. We estimate that around 70%-75% of the fibre laid out in SSA over the past five years was laid out in the interurban segment. In effect, African metros are not fiberized enough; we estimate that fewer than 20% of Africa’s metros with at least 250,000 inhabitants are served by an open access metro fibre ring. This makes the densification of the African metro as one of the most promising opportunities in the African ICT market today. Overall, we are projecting metro fibre demand to rise by a 30% CAGR between 2017 and 2022; in absolute terms, we expect demand for terrestrial fibre leased capacity to triple from 2017 levels.